This shirt has such a beautiful message to share with children. They are SO loved! We use boutique quality shirts from ARB Blanks or Blossom Blanks depending on availability. 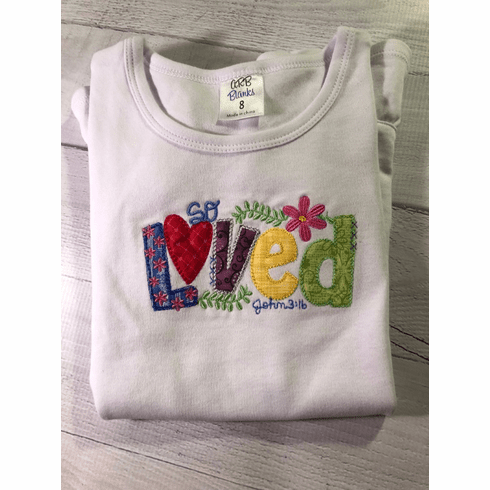 All of our embroidered shirts feature Cloud Cover on the back side to protect your child's skin for a rough surface. Available Shirt Sizes: 12 months through 8 See pictures for sizing charts. Need something a little different? Message us to discuss options. Care Instructions: - Wash in cold water with like colors on gentle. -Hang to dry or tumble dry on low heat. - For best results, place a clean white pillowcase over the design before ironing. Production Time: Currently orders are taking one to two weeks to complete.